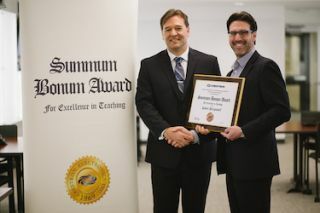 Crestron awarded Rob Peregoodoff, director of learning services at the University of British Columbia’s UBC Sauder School of Business, with the Summum Bonum Award for Excellence in Teaching during a special award ceremony at UBC. Crestron’s director of education programs, Roger Takacs, presented Peregoodoff with a commemorative plaque and cash prize during the event, which recognized Peregoodoff for his long-term commitment to students and faculty, and his dedication to the transformation of education through technology. Latin for "highest good," Summum Bonum is an expression used in philosophy to describe the supreme good, the greatest moral achievement and ultimate humanitarian goal. For more than 7 years, Peregoodoff has consistently demonstrated a passion and dedication for technology at UBC. He was pivotal in transforming a traditional business school classroom into a forward-thinking, active learning space. The Learning Labs provide a transformative educational experience by fostering active and engaged learning and collaboration, both in person and with global partners via video collaboration. By creating these labs, Peregoodoff demonstrates persistence, vision, and enthusiasm for pushing the boundaries of how technology can enhance the learning experience. Crestron demonstrates its commitment to innovation through education by creating an award to celebrate passionate teachers. The Summum Bonum Award of Excellence in Teaching recognizes the crucial role that learning innovation plays in the academic and personal development of students. This prestigious award is presented to education professionals with a track record of enhancing student learning experiences with the goal of making a difference in their lives.